Wojciech Banaszczyk. Balancing vectors and gaussian measures of n-dimensional convex bodies. Random Structures & Algorithms, 12(4):351–360, 1998. This result came to my attention from a talk given by Sasho Nikolov here at Rutgers on his paper with Kunal Talwar on approximating hereditary discrepancy (see Kunal’s post from last year). The result is pretty straightforward to state. Banaszczyk’s Theorem. There exists a universal constant such that the following holds. Let be an real matrix such that the -th column satisfies for , and let be a convex body in such that , where . Then there exists a vector such that . This is a pretty cool result! Basically, if your convex body is big enough to capture half of the probability of a standard Gaussian, then if you blow it up by to get , then for any arbitrary collection of sub-unit-norm vectors , I can find a way to add and subtract them from each other so that the result ends up in . • The expected number of moves is . • The expected number of times two matching cards are unwittingly flipped over is . • The expected number of flips until two matching cards have been seen is . If no known pair is known, flip a random unknown card and match it if you can. If the first card is not matchable, flip another random unknown card to learn its value (and remove the pair if it matches. This strategy exploits optimally when it can and explores optimally when it can’t. The second bullet point in the abstract is the gain from getting lucky, i.e. two randomly drawn cards matching. The paper is an interesting read, but the arguments are all combinatorial. Since the argument is a limiting one as , I wonder if there is a more “probabilistic” argument (this is perhaps a bit fuzzy) for the results. The Wizard of The Crow [N’gugi wa Thiong’o] — This is an epic political farce about an African dictatorship. It’s a bit slow getting into it, but once I was about 70 pages in I was hooked. It’s absolutely hilarious and tragic at the same time. I’ve not read a book like this in a while. Ngugi’s imagination is broad and open, so the absurd situations just keep escalating and mutating. One of the effects is that if you looked at the situation midway through the book, you would ordinarily have no idea how things came to such a state, but thanks to the storytelling you can see the absurd (yet stepwise somewhat reasonable) sequence of events that led there. From now on I will always have the phrase “queueing mania” in my head. Highly recommended. The Crown of Embers [Rae Carson] — a continuation of Carson’s YA series set in a sort of pseudo Spanish colonialist fantasy land. It’s hard to parse out the politics of it, but I’m willing to see where the series goes before deciding if it is really subverts the typical racial essentialization that’s typical of fantasy. The colonial aspect of it makes it most problematic. The Wee Free Men [Terry Pratchett] — a YA Discworld novel. Feels fresher than the other later Pratchett Discworld books. Equal Rites [Terry Pratchett] — an early Discworld novel. Feels a little thinner than some of the others, but it had some cute moments. The Republic of Wine [Mo Yan] — Another political farce, this time set in China. This has to be one of the more grotesque and crass novels I have read… maybe ever. The title might be better translated (and Americanized) as “Boozelandia.” The novel is part correspondence between an author (named Mo Yan) and an aspiring writer from the state of “Liquorland,” partly short stories by said aspiring writer, and partly a story about an investigator sent to ascertain whether state officials are raising children to be eaten at fancy dinners. It’s got a kind of gonzo style that will definitely appeal to some. I liked it in the end but I was also totally unaware of what I was getting into when I opened it. 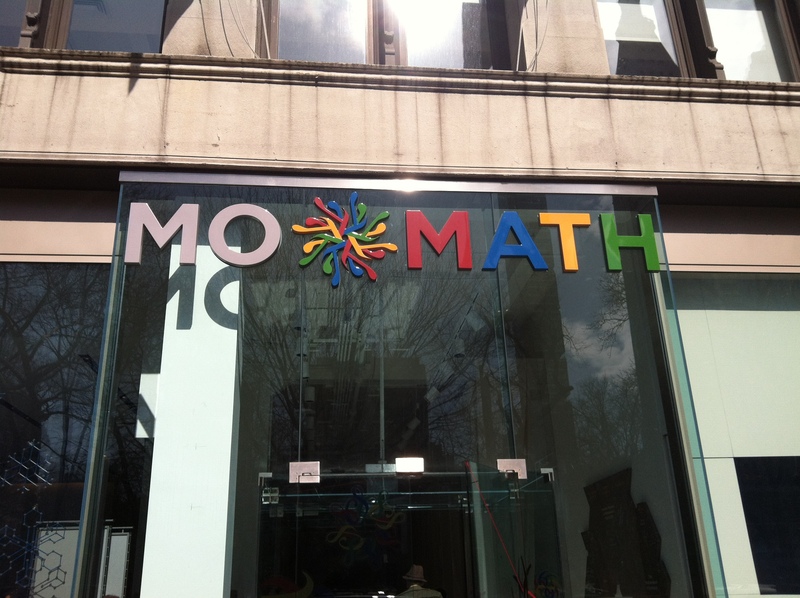 I was in New York on Sunday afternoon and on the suggestion of Steve Severinghaus we took a trip to the brand-new Museum of Mathematics, which is a short walk from the Flatiron building. It’s a great little place to take kids — there are quite a few exhibits which illustrate all sorts of mathematics from recreational math and Martin Gardner-esque pastimes like tessellations to an interactive video-floor which draws minimum distance spanning trees between the people standing on it. It apparently does Voronoi tessellations too but it wasn’t in that mode when I was there. There’s also a video wall which makes your body into a tree fractal, games, and a car-racing game based on the brachistochrone problem. The kids were all over that so I just got to watch. One of the nice things was that there was a touch-screen explanation of each exhibit from which you could get three different “levels” of explanation depending on how much detail you wanted, and also additional information and references in case you wanted to learn more. That’s good because I think it will let parents learn enough to help explain the exhibit to their kids at a level that the parents feel comfortable. That makes it a museum for everyone and not just a museum for math-y parents who want to indoctrinate their children. On the downside, a lot of the exhibits were broken or under repair or under construction, so we really only got to see about 2/3 of the things. Apparently it’s also a good place to go on a first date, as evidenced by some surreptitious people-watching. So if you’re in New York and want a romantic or educational time (aren’t they the same thing? ), go check it out! This film about the matrix singular value decomposition was made in 1976 at the Los Alamos National Laboratory. Today the SVD is widely used in scientific and engineering computation, but in 1976 the SVD was relatively unknown. A practical algorithm for its computation had been developed only a few years earlier and the LINPACK project was in the early stages of its implementation. The 3-D computer graphics involved hidden line computations. The computer output was 16mm celluloid film. The first Star Trek movie came out in 1979. The producers had asked Los Alamos for computer graphics to run on the displays on the bridge of the Enterprise. They chose our SVD movie to run on the science officer’s display. So, if you look over Spock’s shoulder as the Enterprise enters the nebula in search of Viger, you can glimpse a matrix being diagonalized by Givens transformations and the QR iteration. An animation of integer factorizations. Goes well with music. (h/t BK). Tony Kushner is kind of a tool. I find this unfortunate. But I still want to see Lincoln. Aaron Roth reports that the DIMACS tutorial videos have been posted. A perfect time to brush up on your differential privacy! An analysis of the Thai government’s menu served to President Obama. A Choose Your Own Adventure version of Hamlet, from the creator of Dinosaur Comics. The ACME Catalog, for your roadrunner-catching needs.